In international development, as with so many other fields, information is everything. OK, that’s kind of a broad statement, and a bit of a “no duh” to boot. But our ultimate goal is capacity building writ large, and so a failure of information exchange is in some ways a failure of the development industry as a whole. The reality is far too many projects reinvent the wheel with each iteration: Programs don’t scale. people don’t build on one another’s successes. It is to respond to this issue that Tony Barclay, ex-CEO of DAI, started the Development Practitioners Forum, after retiring from DAI as CEO for many years. But this post is less about our organization (the curious can read more at our website), and more about a different way of looking at audiences and the mechanics of knowledge sharing. Too much overhead – have you ever edited a wiki? Uploaded to SharePoint? So what if you’re no part of this chain? And you have a small local NGO in Kenya? And don’t know what [[Link]] means? And your internet connection is too slow to read a complex mashup site? We wanted to serve this demographic. And so InfoSpring was born. Our number one goal was to break the “vertical” orientation of knowledge sharing. That is, to use the often touted peer to peer model to make sharing of knowledge happen between individuals, rather than between organizations, or up and down the chain of command within organizations. To do that, we adopted the most natural way humans have to share their knowledge: Q&A. Sites like Ask.com, Amazon’s AskVille, and Answers.com have been doing this for ages, but we wanted a community – a group of people working in the same general field who could engage on a level playing field. So we built two communities, one online and one offline. 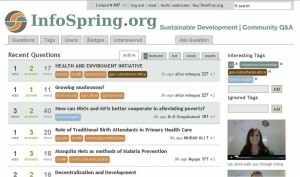 InfoSpring is our online community, where development practitioners are able to browse questions, pose their own or offer up answers. To complement it, we also ran a pilot country chapter program in Liberia to bring a similar service to the folks doing some of the most important work out in rural villages miles from anything resembling a network connection. The idea was that one person (a Fellow) would tap into their network, bringing together informal meetings of practitioners, where they would do just what InfoSpring does – source and share solutions. The Fellow can then act as a conduit for this information, bringing unresolved issues to the web platform and global community, and then disseminating outcomes to their local peers. So did it work? It may be too early to judge, but so far, yes! 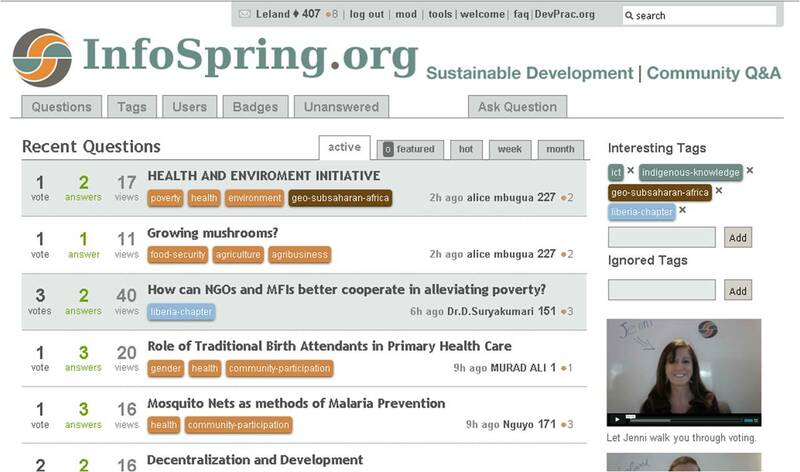 InfoSpring shot past 1000 members recently and continues to grow. We have community members from over 70 countries, with large, active contingents in Kenya, the Philippines and Cameroon among others. For the Liberia chapter, our Fellows have written posts about their experiences on a month to month basis here, so you can judge for yourself. It’s unfortunately become impossible for us to financially maintain multiple chapters, but our Kenya users are beginning to bring the concept to its logical conclusion in a more sustainable way, by building their own independent community. More than anything, the concept of an open community of practice has really resonated in some underserved communities, which could serve as a lesson for future knowledge-based initiatives: your audience is larger than you think! Include them! An ICT for development enthusiast and all around geek, Leland Smith lives in Washington, DC, where he splits his time between DAI, a USAID contractor, and the Development Practitioners Forum.